When I tell people that I decided to “leave engineering and become a geologist,” most of them respond with, “Wow, that’s different!”, or “That’s quite the change.” And initially, I thought the same thing. How much can building spacecraft and studying rocks overlap??? The years since beginning grad school have been eye-opening, to say the least. As an engineering student I learned about materials; how to understand their limits and avoid them, so that I could design part of a machine, building, or spacecraft, secure in the knowledge that the item – whatever it was – wouldn’t fall apart. “How much load can you put on this steel beam before it bends? Divide that number by 2.5 and you’ve got your design limit.” Engineering is about avoiding breaking or bending, because when beams bend or a bolt breaks, your machine becomes useless at best and dangerous at worst. Well, too bad for all the engineers: the Earth is CONSTANTLY BREAKING AND BENDING. Faults like the San Andreas are brittle fractures of the Earth. The Earth’s mantle is solid rock that is, at the same time, in constant, incredibly slow motion. So the study of geology is about understanding the limits of a different material – rock – and what happens after you go beyond them. To that end, “we” (geologists and engineers) have spent unbelievable amounts of time coming up with carefully crafted machines – which need to avoid breaking – to squish the heck out of rocks – which we want to break or flow – and see what happens. In my research, the rock in question is made up of a mineral called ice. Yes, ice is a rock! 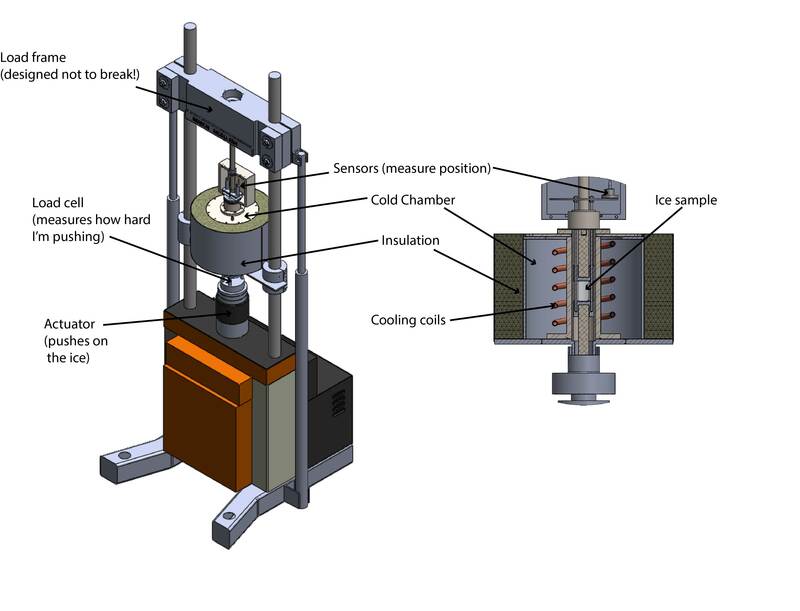 To figure out what happens when ice is pushed beyond its limits, I had to apply my engineering background to designing an experimental apparatus that could a) keep my ice from melting, while b) measuring the extremely slow (you might even say “glacial!”) change of shape of the ice during my experiments. Geology provides the “design requirements,” which I then employ to make engineering decisions while designing the machine. The process has challenged my engineering skills and pushed me to develop better understanding of aspects of engineering – such as measurement system design – which I had little experience in. The result? A machine originally designed for engineering tests, now outfitted with a cooling chamber that goes down to -100 degrees C and a sensor system capable of measuring position changes as small as 0.000000001 meters. Previous Geologists and Engineers Head North to Find… Ice! Well put! In my M.Sc. research I applied engineering analysis methods to glacial sedimentology. But it took some convincing with the editors to get it published because it didn’t fit the usual mold.